One of the most common logical fallacies used by Christians is the fallacy of Incredulity. It is sometimes called the “Lack of Imagination Fallacy,” because it basically assumes that if a person doesn’t understand, or can’t imagine a certain position, that position is automatically wrong. Needless to say, that sort of logic is blatantly flawed. To this day, no one truly understands gravity, but it remains a very real factor in our every day lives. When it comes to the subject of hell, there is great debate on the subject. For most believers, the doctrine of hell is an idol. It remains mostly untouched, unstudied and just accepted, for fear that they may end up there for questioning it. But for some believers, they actually take Paul’s command of studying the Word to heart. They have actually invested a great deal of time and energy into this subject. In so doing, they have come to varying positions on one of the three major views, Infernalism, Conditionalism, and Universalism. At this point, a person who may come to a different understanding of the topic of Hell, outside the Eternal Conscious Torment theory, is generally faced two common objections. Firstly, it is believed that such a person has been deceived by the devil, followed by their abandonment of the truth of Scripture. With nothing more than a surface reading of Scripture, coupled with man-made traditions and teaching from the Church, most believers just cannot believe their Bible might actually teach something other than what they currently believe. It is greatly dishonest to say that Conditionalist or the Universalist has been deceived or abandoned the truth of Scripture, when most believers in Infernalism wouldn’t even study the subject, far less read other believers’ arguments and Scriptural studies to see how they have arrived at their position. 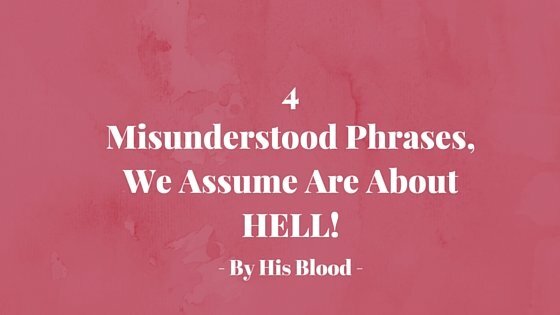 So with that said, I’m looking at 4 common phrases used in the New Testament that are commonly believed to be related to the afterlife and Hell, to give an example of why our assumptions are not actually found in the Scriptures themselves. For the purposes of this article, I’ll be skipping over the fact that there are four distinct words translated as Hell, and each has it’s unique uses, Sheol, Hades, Tartarus, and Gehenna. But anyone doing a further study, should look into these words more closely. The Annihilationist may say in response, “Well yes, the fires burn forever, but not the contents! The verse says that the chaff will ‘burn up’, imply that they will eventually come to nothing.” So far from being eternal conscious torment in that fire, the person will burn up into non-existence. The Universalist can say, “The phrase ‘unquenchable fire’ has been used in Scripture before to describe God’s judgement against Nations. When Jeremiah spoke about the coming destruction of Jerusalem by the Babylonians, unquenchable fire or fire that cannot be quenched was used to describe the national judgment. Personally, I believe the Universalist has the better argument, his view actually gives a best match for the verse. When we compare Scripture with Scripture, we see other places where unquenchable fire is used to describe Jerusalem’s judgment in this life. Jeremiah 7:20 Therefore thus saith the Lord GOD: Behold, mine anger and my fury shall be poured out upon this place, upon man, and upon beast, and upon the trees of the field, and upon the fruit of the ground; and it shall burn, and shall not be quenched. The position of national judgment also fits the Annihilationist’s point about the chaff, being burned up. But we will explore than in the next topic. Jesus uses this phrase, of fire that is not quenched and where their worm dies not, three times in the book of Mark, while talking to the Jews. It is a repeat of Jesus’ sermon on the Mount teaching from Matthew chapter 5. The Universalist can say, “Jesus is quoting a passage from the Old Testament prophet Isaiah, where he foretold the destruction of Jersualem by the Babylonians. The verse has nothing to do with the afterlife, as the people are said to go out and behold the dead bodies of the wicked breakers of the Law. If the Universalist is right, and these passages are talking about National Judgment, they would also satisfy the Annihilationist’ position, about being “burn up” and the people eventually coming to nothing. The difference is that the Universalist sees that people’s BODIES come to nothing, and that these verses are not actually talking about the afterlife. 3. Weeping and Gnashing of Teeth. Matthew 13:41-42 The Son of man shall send forth his angels, and they shall gather out of his kingdom all things that offend, and them which do iniquity; And shall cast them into a furnace of fire: there shall be wailing and gnashing of teeth. The phrase “weeping and gnashing of teeth” is used seven times in the New Testament. All of them are in the Book of Matthew, save one reference in the Book of Luke. It is commonly taught that weeping and gnashing of teeth is synonymous with the sufferings of Hell’s fire. The Universalist can say, “Jesus is quoting from the book of Lamentations about the destruction of Jerusalem by the Babylonians, as a warning of what was about to happen to Jerusalem by the Roman forces in 70 AD. Lamentations 2:15-16 All that pass by clap their hands at thee; they hiss and wag their head at the daughter of Jerusalem saying, Is this the city that men call The perfection of beauty, The joy of the whole earth?All thine enemies have opened their mouth against thee: they hiss and gnash the teeth: they say, We have swallowed her up: certainly this is the day that we looked for; we have found, we have seen it. This is more evidence to suggest that the weeping and gnashing of teeth is something that happens on the earth, and not in the afterlife. Another use of the weeping and gnashing of teeth, that suggest that the phrase may be used on the Earth, is actually the reference in the Book of Luke. Verse 29 describes those who come from the north south, east and west and shall sit down in the Kingdom of God. The fact that there are no such directions in the afterlife can suggest, while not conclusively so, that these verses are talking about something that happens on the Earth. 4. Hell used to describe National Judgment. The last use of Hell in the Scriptures that I want to examine, is something that generally Infernalist and Annihilationist tend to overlook entirely. It’s the fact that the word Hell itself, is often depicted to describe national judgment in both the Old and New Testaments. The reason it’s not discussed by either group is because it’s evident that the use of the word in it’s context, is talking about the destruction of a city, and not people. Seeing how the word is used in the other places of Scripture is the best way to determine it’s meaning in our texts. In the case of Matthew 11:23, it’s clear that Capernaum being brought down to hell does not mean the entire city descending into some infernal torture chamber; instead it means the city will be judged and destroyed. Similar uses of the Old Testament word, Sheol, translated as hell, can be seen having the same use. Isaiah 14:4-15. While there is great debate about these passages being in reference to Lucifer (Isaiah 14:12), the context of the verses themselves suggest more inline with the King of Babylon and the nation of Babylon being destroyed. We learn from verse 4, Isaiah 14:4 That thou shalt take up this proverb against the king of Babylon, and say, How hath the oppressor ceased! the golden city ceased! This passage about Babylon’s judgment ends with the same words Jesus quotes concerning what will happen to Capernaum. Both the Annihilationist and the Universalist draw their conclusion from the study of Scriptures, not the abandonment of it. Similarly, it is not deception of the devil, but rather the context, history and word studies of Scriptures that can lead people to a different view on the subject of Hell. I would argue that an Universalist, in order to arrive at that position, must have even greater knowledge and understanding of these things, in order to explain all the assumed hell passages in a different context. On a final note, no Christian, no matter what their view of Hell, is ever in danger of going there. Many try to bully and intimidate people of different views, by threatening that they are going to hell if they don’t agree with their understanding. Anyone who suggests that, firstly is commiting the “Appeal to the Stick” logical fallacy, but secondly, they are admitting their belief that we are saved by our doctrines, and not by Grace through Faith. I would remind such a person that Apostle Stephen, when he was stoned in Acts 7, was a Jewish believer of the Messiah. Everything about his understanding of Scriptures was centered around the Law of Moses. He never read the writings of Paul, or any part of the New Testament. He didn’t know any of the modern Christian teachings that we hold sacred, and we would have nothing in common with him theologically, apart from our belief in Jesus Christ as Messiah. With that said, I would challenge any of these people who claim a different doctrine sends you to hell, to label Stephen a false teacher and claim he went to Hell.